Fourteen years before the Titanic disaster of 1912, a little-remember author named Morgan Robertson's book, Futility, was published. That book got international attention relatively late because it was found to have been a remarkable "prophecy" of the 1912 sinking, almost down to the name of the ship. The novel told of a steamship named Titan that was touted as unsinkable, struck an iceberg while making passage across the North Atlantic, and sank with great loss of life. While not all of the events described in the book detailed the real Titanic disaster, there were enough similarities to give Robertson a "prophet" status among authors of that day. For example, Robertson's Titan was a British steel-hulled passenger ship, 800-feet in length, measuring 70,000 tons, with three propellers, 19 watertight bulkheads and capable of reaching a speed of 24 knots. The Titanic was a British steel-hulled passenger ship, 882-feet long, measuring 60,250 tons, 15 watertight bulkheads, with three propellers and could reach a speed of 24 knots. 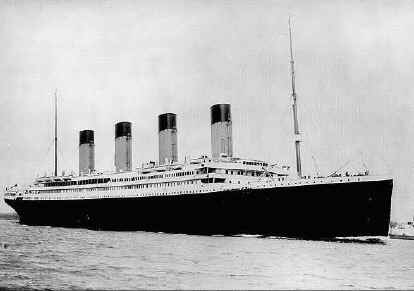 Both the Titan and Titanic had a capacity for carrying 3,000 passengers. There were 2,000 people aboard the fictional ship, and the Titanic was carrying 2,200. Because the vessels were deemed "unsinkable," they were carrying only the minimum number of lifeboats required by marina law at that time. The Titan had 24 lifeboats and the Titanic had just 20. Robertson's ship struck the iceberg on the starboard side forward. That also is where the Titanic was sliced open when it collided with an iceberg. Both events occurred in April. From thereon, however, there are distinct differences between Robertson's story and the real event. Robertson's Titan is steaming from New York to London, and was not on its maiden voyage, while the Titanic was making its first trip from London to New York. The collisions did not occur in the same place. The Titan was hampered by fog while the Titanic was just blindly steaming at full speed under clear skies, although both events occurred in the night. The Titan went down with all but 13 of its people perishing with it. There were 711 survivors of the Titanic. In the book, the Titan capsizes within minutes and sinks almost immediately, thus accounting for the large loss of life. In real life, the Titanic sank in a little over two hours after hitting the iceberg. In the meantime, there was a scramble to get seats on and to launch the available lifeboats. There is yet another strange story involving a British freighter, the Titanian, that was reportedly saved in April, 1935, because a lookout named William Reeves noticed it was in the same location where the Titanic struck the iceberg, had a premonition, and called for the bridge to stop engines. As Reeves later reported the story in the London Times, as the ship came to a dead stop in the water, a large iceberg could be seen dead ahead in the darkness. While there was a freighter named the Titanian that was operating in the North Atlantic in 1935, critics say that there never was a record of such an event in 1935. What really occurred was that the ship, on April 25, was caught in an ice field off St. John's Newfoundland and called for an icebreaker to cut a route through the ice after taking damage to the stern post. The icebreaker Imogene came to its rescue. It appears that Reeves embellished the story in an attempt to become part of the Titanic legend.